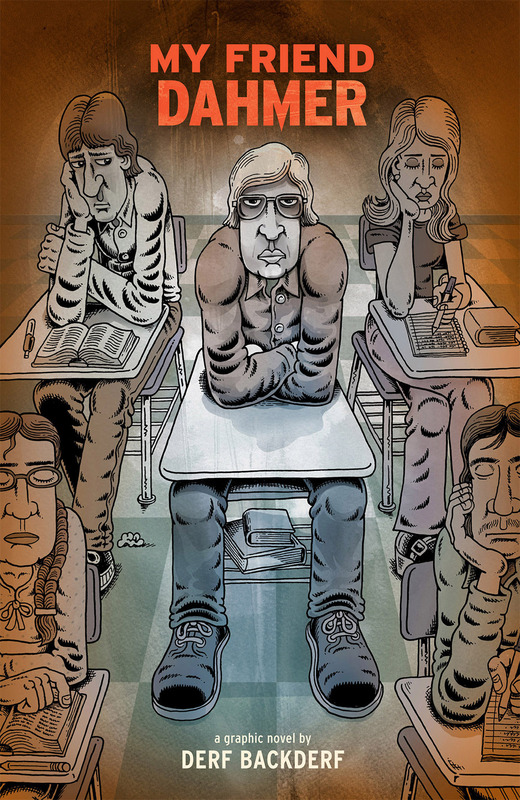 My Friend Dahmer: A Precautionary Tale for Adolescents and Narrators – LILY & GENEROSO 4EVER! Sure, as adolescents and teenagers, we all did stupid things that may have hurt someone else. Most likely it was along the lines of calling someone a cruel name or creating exaggerated, jeering impressions of someone. Regardless, as adults we should look back on those moments with shame. Where exactly is Derf Backderf’s shame in his and his childhood friends’ treatment of Jeffrey Dahmer as a source of entertainment and not as a human being? In the heralded My Friend Dahmer, Derf Backderf details the adolescent and teenage years of Jeffrey Dahmer, exhibiting his anti-social tendencies, his strange fascination with roadkill, and his later debilitating alcoholism. The author here is not only the narrator of the story but also a major character in Dahmer’s teenage years as a supposed friend and the president of the Dahmer Fan Club when the two attended high school together. As My Friend Dahmer progresses, Derf presents a nature versus nurture discussion to try to understand what exactly led to Dahmer’s digression from acceptable social behavior to his horrific, inhumane killings. Written from the perspective of someone who knew Dahmer more than others, the novel does present the man who will go down in history as one of America’s foulest and most nightmarish criminals as a somewhat tragic character, and in the process of trying to humanize a monster with recollections from teenage years, Derf recalls his interactions with Dahmer in order to support his thesis: Dahmer innately possessed concerning anti-social tendencies, but it was the indifference and negligence of the adults in his life that enabled his derailment and his tirade of abject violence. As a standalone thesis, Derf’s is not a bad one; it is expected that given the severity of Dahmer’s brutality and deviance, there are factors of inherent nature being expressed and exaggerated by environmental conditions to drive his grotesque behavior. However, in presenting the moments of interaction between himself and Dahmer, Derf undermines his own part in enabling Dahmer to act on his anti-social impulses, for he and his friends, the members of the Dahmer fan club, exploited Dahmer’s strange tendencies and quirks for their own entertainment and abandoned him when they found him to be too weird and when he became fully self-destructive. Dahmer was an amusement for Derf and his friends, but no more than that. They spoke to Dahmer at school. They arranged performances of Dahmer’s outlandish spasm impressions. They included Dahmer in comics and in pranks. But, never did they invite him to any regular social activity. Dahmer did not go to the movies with the fan club. He did not eat dinner with them. Dahmer was only called up if the group wanted to showcase or experience his eccentricities. And, once the entertainment value faded, Derf and the fan club discarded Dahmer, leading him to even more social isolation (which had plagued his entire life) and giving him even more opportunity to wallow in his deviant thoughts and obsessions alone. With each thesis tied interruption, I began to develop a sense that the thesis of the surrounding adults’ negligence leading to Dahmer’s demise was more of a displacement of the author’s own guilt. Consequently, I constantly waited for Derf to address this guilt, but as I read from the final chapter to the epilogue to the notes and even the sources, I did not find any discussion about the author’s role in further alienating the young Jeffrey Dahmer during an age of prime social development. I just continued to see the blame finger pointed at the adults and then eventually at Dahmer himself in the final notes. With My Friend Dahmer, Derf Backderf proves to be an inconsistent and unreliable narrator, unable to stick to his thesis with his narrative and, overall, presents himself as a pretty awful human being in his false friendship with Dahmer, making me wonder what exactly are his motivations for telling this story in the first place. I give him credit for his commitment in sharing the details of his sources and his commentary on each moment included in the novel, but Derf Backderf himself does not quite seem to understand his own role in his answer to, “What led to the creation of Jeffrey Dahmer, the killer?” and, as a result, makes this novel seem as exploitative as his own teenage interactions with Dahmer. My Friend Dahmer includes fascinating small moments of Dahmer’s formative years, but it is suffocated by the constant reminder of Derf’s imperfect thesis and the conflicting moments where the Dahmer fan club could have intervened, particularly when they saw him falling deeper and deeper into alcoholism, a topic far easier to discuss and address with people who could help as compared to Dahmer’s other, more inexplicable actions. Derf Backderf and his friends never befriended Jeffrey Dahmer, and it’s shameful that Derf would even dare to call this book My Friend Dahmer. Dahmer was a plaything to him and his friends, and this attitude was as responsible for allowing Dahmer’s spiral out of control as the silence of the surrounding adults. Rather than delivering Derf’s thesis, My Friend Dahmer enlightens the audience with probably one of the ultimate horror stories of the bystander effect for teenagers and adolescents, serving, at best, as a precautionary, propagandistic tale rather than an intelligent discussion of good versus evil and the origin and motivations behind each. My Friend Dahmer is available via Abrams ComicArts. I agree with you completely. It’s like a horror movie where the anonymous narrator starts out by simply relating the story, but as it goes along it turns out that he had a hand in creating the carnage. I can’t ever say that I feel anything less than hatred for Dahmer, but….Jesus Christ in heaven, look what Backderf and his pals did to him. Thanks for reading mykawillkeeponrolling! Yeah, I had a hard time believing Backderf’s argument that Dahmer became he did because the adults around him failed to notice his anti-social tendencies. It’s absolutely clear that Dahmer had internal demons from the beginning, but I could not help but think that the rise and disbandment of the Dahmer fan club helped to release and further express those demons…. The worst part, for me, was the scene in the mall, when Dahmer’s psyching himself up for his pitiful “Command Performance”. There’s one anticipatory panel where it’s just his face, and the expression on it is one of a once-dignified actor steeling himself to play the one-dimensional lead role in a farce written by idiots. God, I hate feeling sympathy for serial killers. Oh, and did you know that Backderf heard a story from a mutual friend that his former pet jester had been paddled as a senior, and his first instinct was to scribble three extra pages detailing the incident and sell them as part of the ebook version of MFD? On his blog, Backderf described it as a “fabulous scene”. Never thought I’d be defending the honour of a convicted murderer and child molester, but here I am.